Randy began his graphic design career in 1976 with the U.S. Marine Corp as a training support illustrator and combat photographer. He completed his schooling in Iowa with a B.A. in Computer Graphic Design in 1985. Randy was the Media Support Director at Trident Micro Systems for over 20 years, during which time he brought Trident to be a long-time Clark customer. 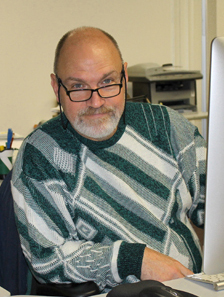 Shortly after Trident was sold in 2014 Randy found a new home in the Creative Department of Clark Communications. Randy has been married to Camery, his college sweetheart, for 30 years and enjoys church and family activities.